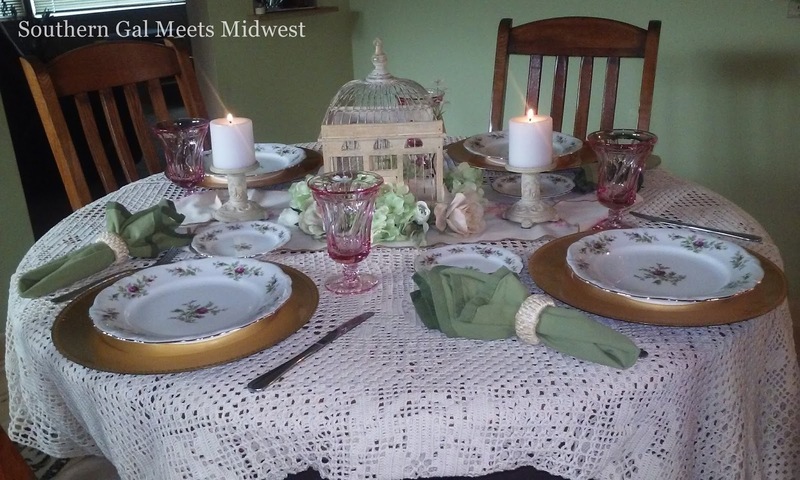 Southern Gal Meets Midwest: Welcome Spring! I have been out of the mix now for a few weeks. The weather is getting so nice here in Iowa and we have been getting outside a lot more (and away from the computer) Those walks after supper are not possible with my thin southern blood during the winter!! I just can't handle the cold. Well, it's not so much the cold but that WIND! It just cuts right through me and I can't get warm afterward. So, I stay indoors and hibernate like a bear. I know it's pretty late (shame on me) but here are a few pictures from the very little Easter decorating I did. This basket was in our office holding various items that really don't have a home and I thought it would look nice on the coffee table in the living room. 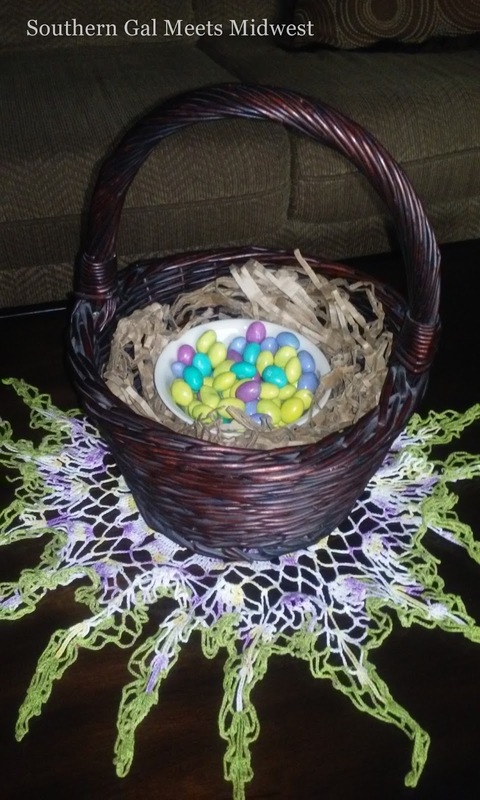 I filled it with shredded gift paper from Dollar Tree added a small dessert bowl and then some M&M eggs. The doily underneath is another my granny made long ago. It adds some color to my otherwise very neutral living room. 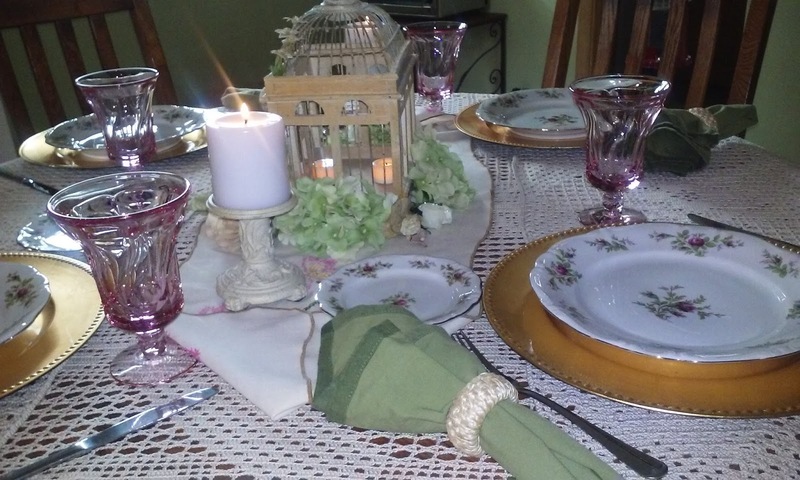 Next was creating a nice table setting with what I already have. This tablecloth was crocheted by my Auntie Thelma and presented to my darling and I as a wedding gift. She made it to fit the dining table when the leaf is in but this time it seemed better to keep the table round as it was just 4 of us for dinner. I did some creative folding to make it fit and....ta da!! The china was something I found packed in a corner of the basement shortly after moving in... it's service for 4 and perfect for Spring! The set has dainty gold trim so my gold chargers complimented them very nicely. The pink goblets were Mama's that she received at her bridal shower in 1962! She gave them to me as I always loved looking at them in her lighted china cabinet when I was growing up. Plus, she said that her entertaining days are over and thought they would get more use with me. She is right, they get used quite often. There are also little matching dessert goblets that will be part of the table setting for a later holiday or celebration. 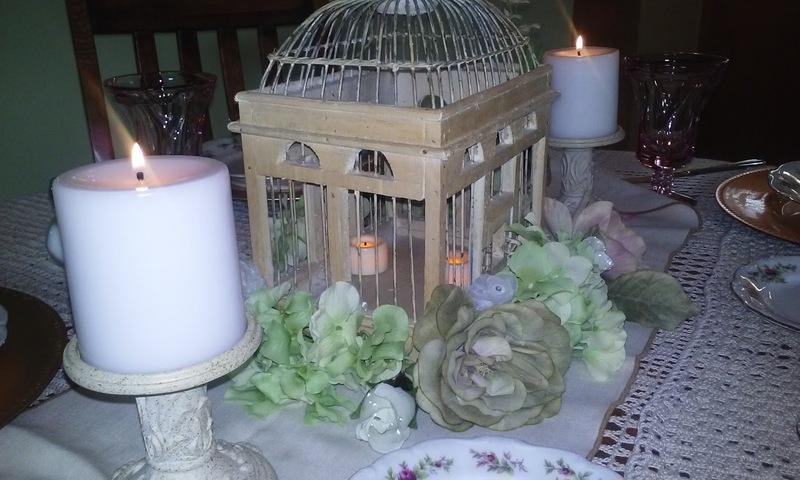 Some candlesticks with linen scented candles were added... they just smell fresh and clean like spring. I found this dainty birdhouse many months ago at Goodwill. It has a vintage feel and needed nothing but a good dusting and a place to fit in. 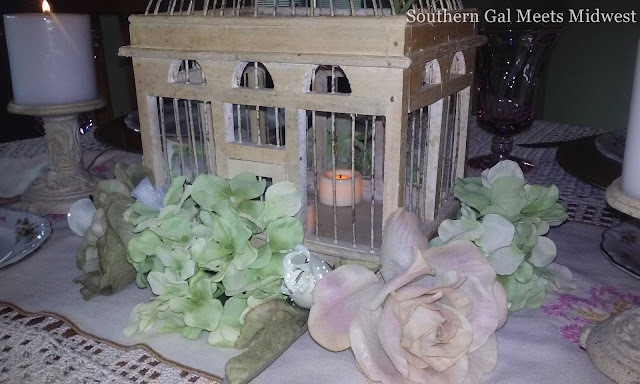 My stash of silk roses and hydrangeas were easy to tuck under the edge of the birdcage and two flameless tea light candles inside finished the look I wanted. So... that's pretty much the extent of my Easter decorating. It was easy to set up and easy removal once dinner was finished. In case you are wondering, we are still working on the pink bathroom remodel. I am sure many of you know that with older homes come all kinds of wonderful little surprises along the way. Those little surprises sometimes stop us dead in our tracks, but not for long as we keep pressing forward and learning patience. I will show you some of the accessories and hardware that are almost completed soon. We have made it to the point the bathroom is functional again but there are still a lot of finishes to be done and I want to reveal it completed. 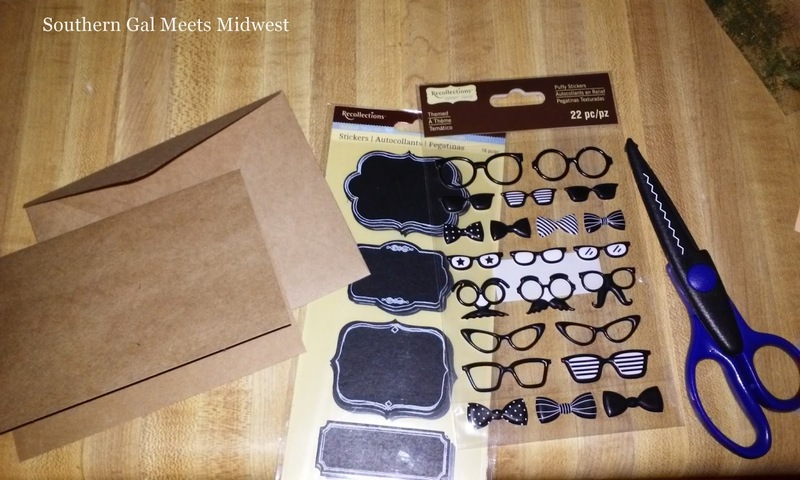 I have also been working on some surprises for my darling. He will be turning the BIG 50 next week! Keeping things hidden and trying to work on them is TOUGH! He is like a small child at Christmas. I am making invitations since there were none like I wanted. Party supplies and gifts from family are coming in the mail and I have let him know he is not to open or ask about anything addressed to me...LOL! Yeah right, like he won't ask. 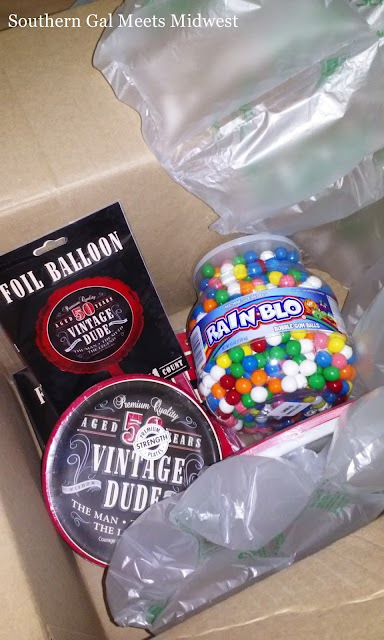 So far though, I am the only one breaking this stuff open...and yes, that is bubble gum. I told you he is like a kid! I am so looking forward to this big day for my love. I will let ya'll know how it turned out. Karen, I love the birdcage and your pretty pink glasses--those will look great all spring! Your Easter basket is very pretty. I love your table setting - gorgeous! Your Aunt made you a wonderful gift, what a treasure to have. Your Mom's goblets are very pretty, they go perfectly with the dishes. Happy future 50th birthday to your hubby, looks like you'll be making it a very special day for him. Enjoy the rest of your weekend! 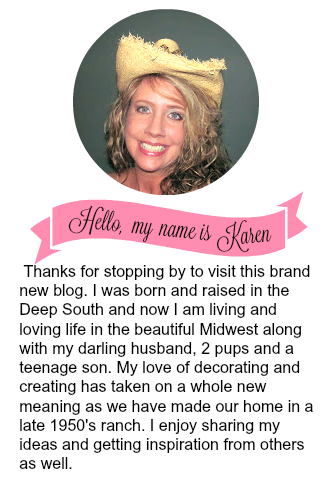 Hi Karen - good luck with the 50th party - sounds great. I'm sure there'll be some good photos! Best wishes, Dawn (Cornwall, UK). Oh Goodness Kim...you would love living in Florida then! Love those pink goblets!! Hope hubby's party is awesome!! I threw my hubby is first surprise party ever back in Feb. and it was so much fun. 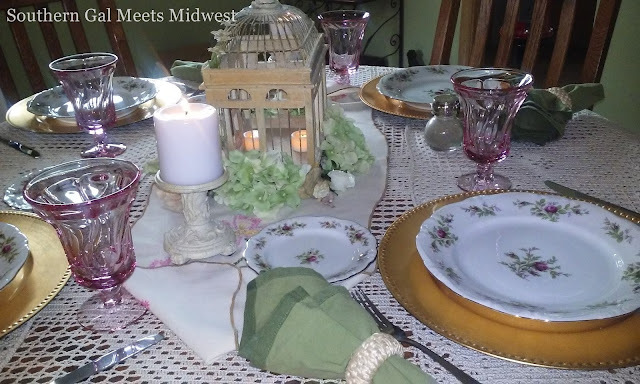 I just love your tablescape.